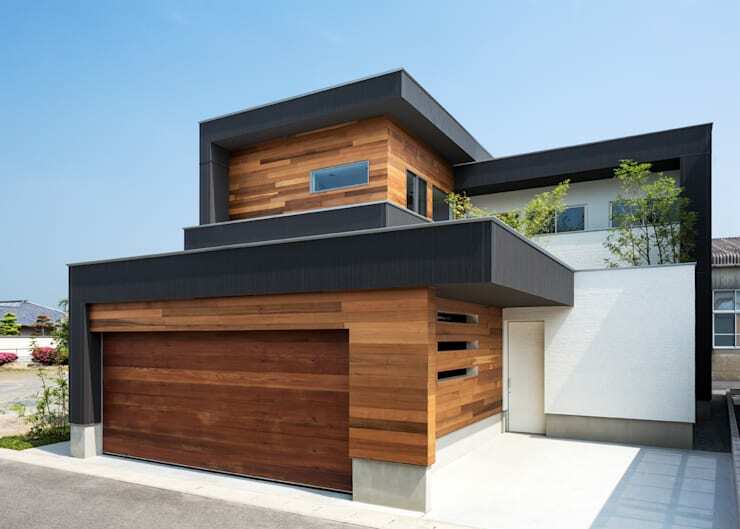 Our architectural gem for the day comes to us from the far east, where Japanese firm Architect Show Co. spoil us with a masterful modern concept coated in wood. 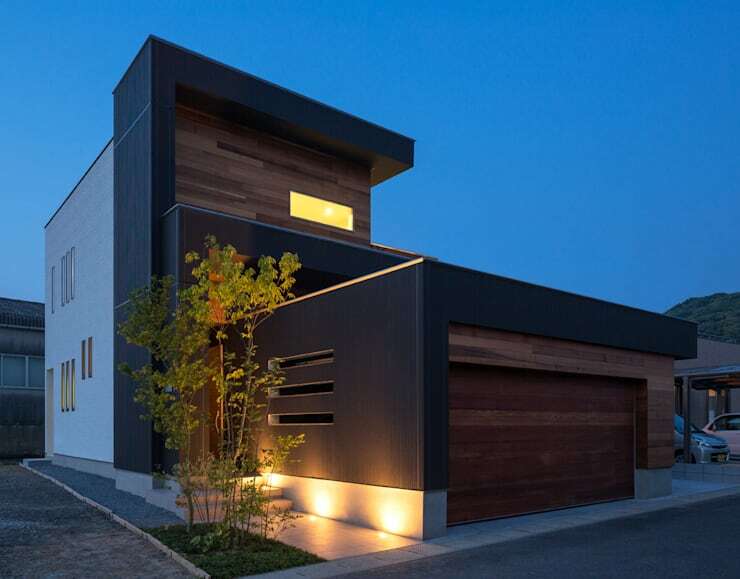 Spanning 120 square metres, this house was built in a quiet rural setting in Nagasaki, Japan. The idea behind the architect’s design was the creation of open and comfortable spaces without compromising the privacy and safety of the family who occupies it. 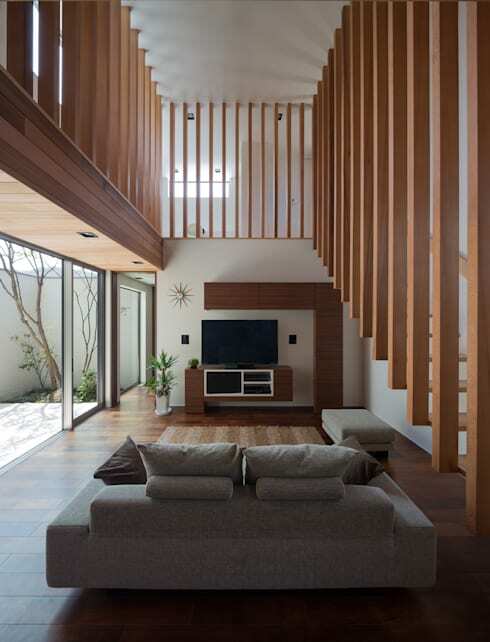 Although wood is the main element used (and seen) throughout the house, it is the different coatings and styles that give the house its gorgeous appearance. With the red cedar presenting a warm ambience for the interior spaces, the house not only seems welcoming and dynamic, but elegant as well. 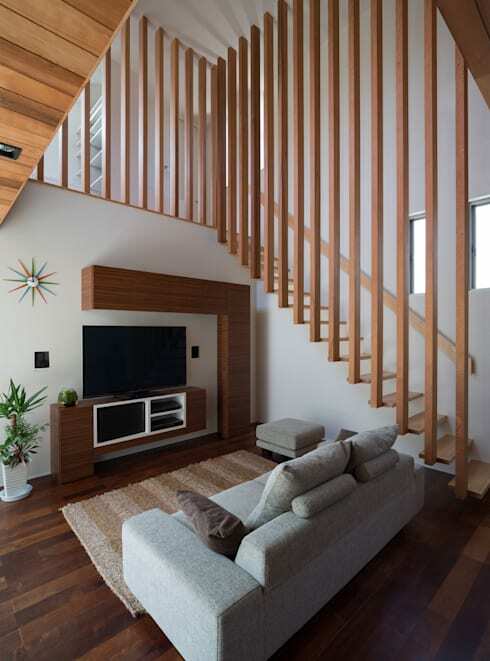 On a more practical note, the wood goes a long way to increase the thermal insulation of the house, making it the perfect living space for the family who loves their stylish interiors, but also their comfortable temperatures. They say never to judge a book by its cover, but it’s pretty difficult not to start loving this house the minute you gaze upon its fabulous facade. It’s unique, it’s very modern, and we can’t imagine how it can’t be the head turner on the block. No pitched roofs here, as the house seems to rise out of the ground through several overlapping blocks, each as distinct and striking as the next. Notice how stunningly the wooden surfaces become the noticeable element from the outside, lending a touch of warmness to the chic white and charcoal-coated exteriors. 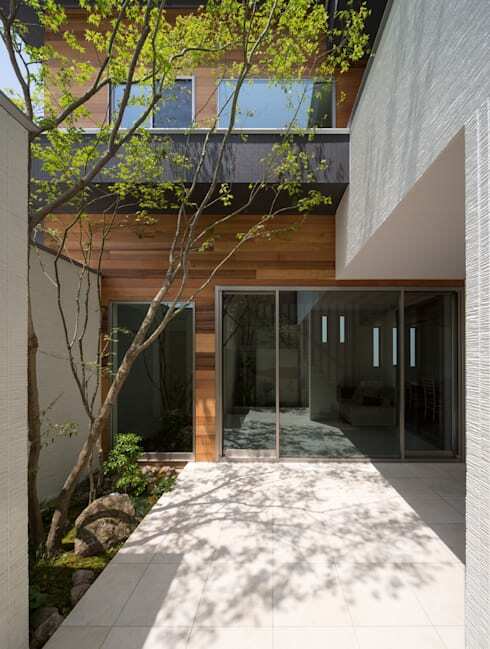 Upon entering the front entrance, we find a small but beautiful courtyard – completely fenced off for maximum privacy. This allows the residents to enjoy a bit of fresh air and sunshine without having to worry about spotting a nosy neighbour. And since the patio is so conveniently close to the glass sliding doors leading inside, a lazy afternoon of sunbathing and relaxing on this spot seems like a great idea. But for now, we demand to see more of this stunner. In need of some relaxation? We’ll show you how to: Have Your Own Holiday Garden. If we thought that the outside used up all the wood, we were sorely mistaken. The timber continues to be the dashing protagonist in the interior story, casting a soft and stylish vision into the rooms. What is not to love about this charming living room? A snug couch to relax on, a fabulous flat screen to enjoy the latest blockbusters, chic and serene décor. One gets that spa-like vibe by simply looking at this space, and we can just imagine how rejuvenated and relaxed a lazy afternoon in this room can make one feel. Although the room is narrow, it is quite long, and the narrow wooden beams seemingly sprouting upwards aid in the visual space of the room. The living room flows superbly into the kitchen and dining area, making this one luxurious living area. Interconnecting these areas allow for a much better circulation of space and people, so that regardless of in which room you find yourself, you can still follow every beat of the conversation. The coating of wood in the entire kitchen makes it into an area that is simultaneously ultra modern, yet charmingly approachable. With the decor taking a minimalist approach and instead focusing on the clear space, the rooms seem to be growing comfortably larger and wider. Be sure to take a look at homify’s range of delectable dining rooms, in every imaginable style and colour for your convenience. Viewing the staircase (with its remarkable railing and serene colours) is a relaxing activity on its own, but following it upstairs will take us to the bedroom and bathroom areas. 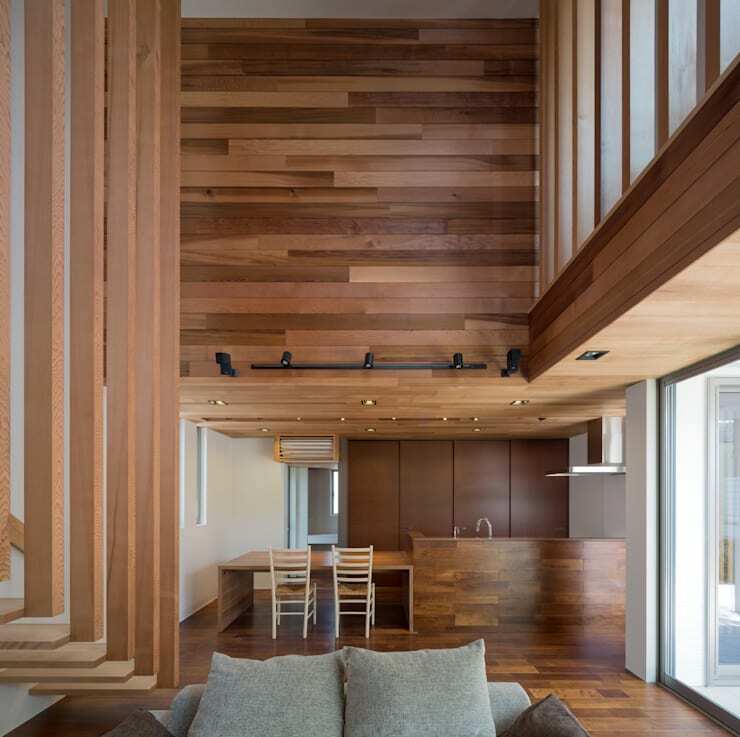 The wooden beams serving as the railing offers both a barrier for privacy and safety, yet are also spaced far enough for a flowing and harmonious feeling. Notice the striking decor serving as a frame for the TV unit. Its linear design blends in marvellously with the dominating patterns of this modern space. The fact that it’s also in a warm coating of wood is just a bonus, as far as we’re concerned! Time for the obligatory night shot… It would truly be a shame to hide this modern beauty in the shadows when the sun departs. However, thanks to sufficient exterior lighting, the house’s unusual design is emphasised beautifully as the darkness approaches. Seeking some unique options for your indoor and/or exterior lighting? Get some bright ideas by looking at our range of lighting professionals here on homify. Tell us what you thought of this house. The size, the wooden coatings, the layout...we’d love to know!